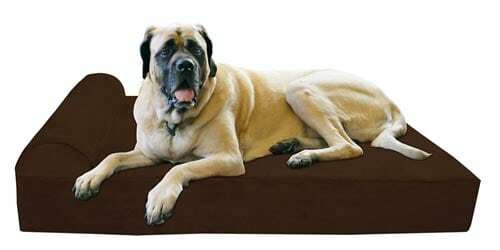 Looking for a high quality orthopedic bed for your giant breed Tripawd dog? Happy Hannah (aka Tripawds Member Benny55) highly recommends the Big Barker Orthopedic Dog Bed. Big Barker Dog Beds are made with 7″ of superior quality American-Made foam. Specifically designed to completely support every nook and crevice of a big dog’s body. Your dog will not sink into this bed. See the Tripawds Gear Blog for more selections and reviews of orthopedic dog beds for comfortable rest during recovery and for years to come. These plush yet firm beds are recommended since they will not bunch up, making it easy for recovering dogs to get comfortable without stumbling on unstable bedding. 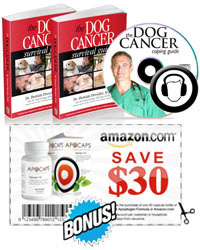 Thanks for shopping with links in this Tripawds Amazon blog! No matter what you purchase here, from household goods to pet supplies, a portion of sales will go toward keeping the Tripawds Nation online. This looks like a great bed! My big boy (118 lbs before amputation) loves his Savvy Doggy bed. He used to be so stiff and sore when getting up from his traditional bed or the couch. I did a little research and decided on Savvy Doggy, and he no longer looks like he is stiff and sore after a long nap. I bought the large one (37″ x 47″), and it’s big enough for both of us to curl up (or sprawl out) on together. Just want to add that Happy Hannah has given this bed quite a workout now for several months and it hasn’t lost one bit of it’s shape—-no sagging at all!! It truly is the “Tempur-pedic” of the dog world—only better!! Really, if just a bit larger, it would give “people” beds competition!!! The best part of all—-order through Amazon.com and it helps Tripawds!!!!! Thanks for the feedback (and the shout out, Sally!). It always helps to know what pawrents find useful for their pups. Re: The Big Barker Bed—My 118 lb. Bull Mastiff is over eight mnths post amp. and has had this bed about nine months now. I do put squishy pillows around and she “arranges” her bed as she pleases. I highly recommend it for big dogs recovering from surgery. It’s firm enough they can stand up without falling and slipping. And no! I have no connection to this company! I’m just very connected to my dog and fnd this bed to be perfect for her comfort and proper big dog support! PS… Of course make ALL your purchases through Amazon and support the Tripawds community at the same time! Sally, we really appreciate your taking the time to come here and update us on how it’s working. That is great! If any dog puts a bed to the test it’s Hannah, we’re so glad to hear that it’s still comfy as ever.